This is lovely, I gave this to my niece to wear at her wedding and she looked stunning in it. It was a very good price for the set. My niece just loved it so much that she wore it on New Years. Silver Tone Collar Necklace (23mm), Round Simulated Pearls, 16"
Treat yourself to our elegant white Imitation pearl and crystal flower leaves bridal necklace and earrings set and feel like a celebrity whenever you wear it. The nature inspired design is rich with style. Our wedding necklace is filled with white luminescent pearls and a vine leaves design that is adorned with sparkling clear crystals. The combination is simply stunning. The hint of sparkle will enable you to wear our silver tone wedding necklace set with everything from a formal wedding gown to your favorite little black dress. Slip on our crystal bridal necklace with your favorite casual outfit to dress it up or wear a silver bridal earrings to complement more formal attire. If you are looking for a perfect piece of pearl jewelry, we think this is it. 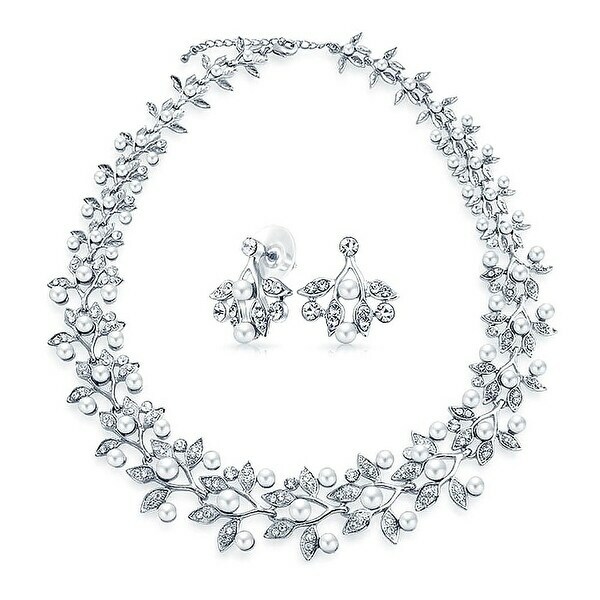 The earrings secure with a post backing and weigh a total of 3.6 grams, while the glamorous bridal necklace weights 60.4 grams. The largest white pearl on the silver bridal necklace measures 6mm and the smallest measures 4mm. Our crystal bridal necklace is rhodium plated, secures with a lobster claw clasp, hangs a perfect 18 inches in length and boasts a 2 inch extender. Order yours today. Simulated Pearl and Crystal Silvertone Set 16.5"-19.5"